Before we hurtle back to the present day, I want to share these photos from the early decades of the 20th century (enlargeable, and available even larger, see ‘More’, below). 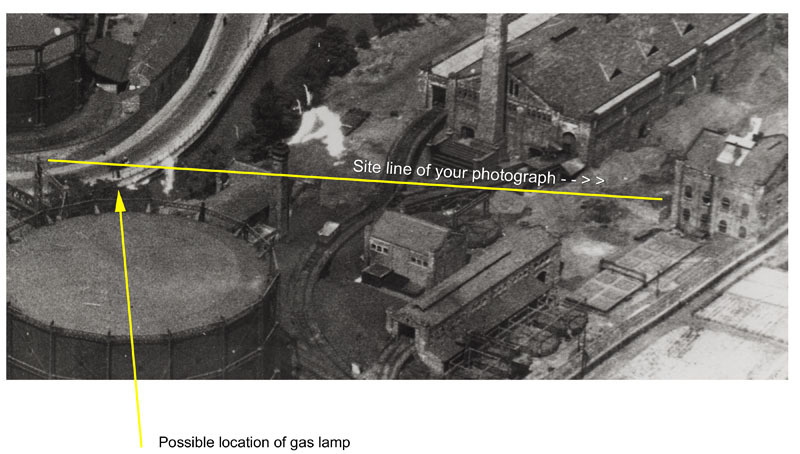 The gas works which once occupied Foss Bank and part of Heworth Green. 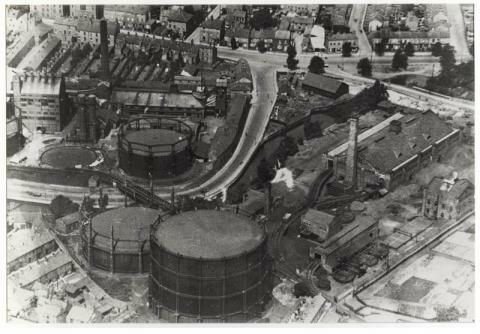 Hard to recognise now as it’s all changed utterly, but the curving road tracing the shape of the Foss here is the same. Within its curve is now the Sainsbury’s store on Foss Bank, and Go Outdoors (was Homebase). The area to the right has been redeveloped in recent years with apartments, as covered in older pages on this website. It’s again thanks to a visitor to these pages that I have these photos. 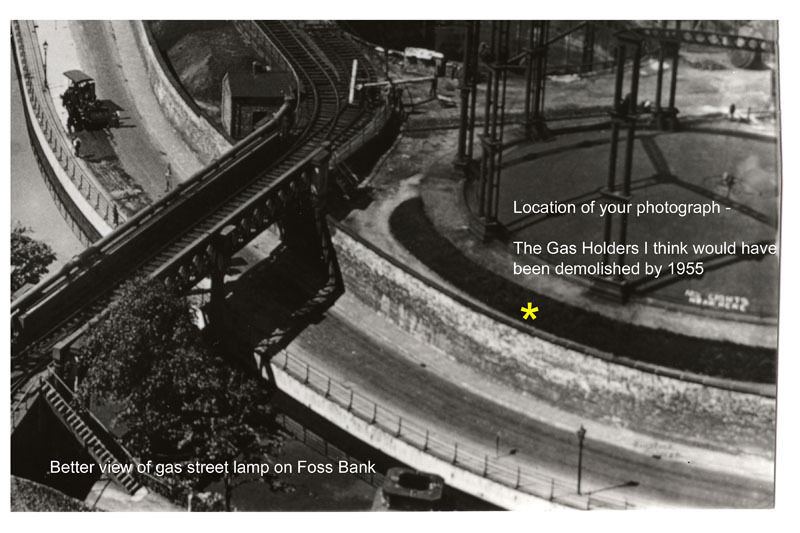 Sent in response to an earlier page on the ‘Gasworks gang’. From the same place, but looking towards the city centre. 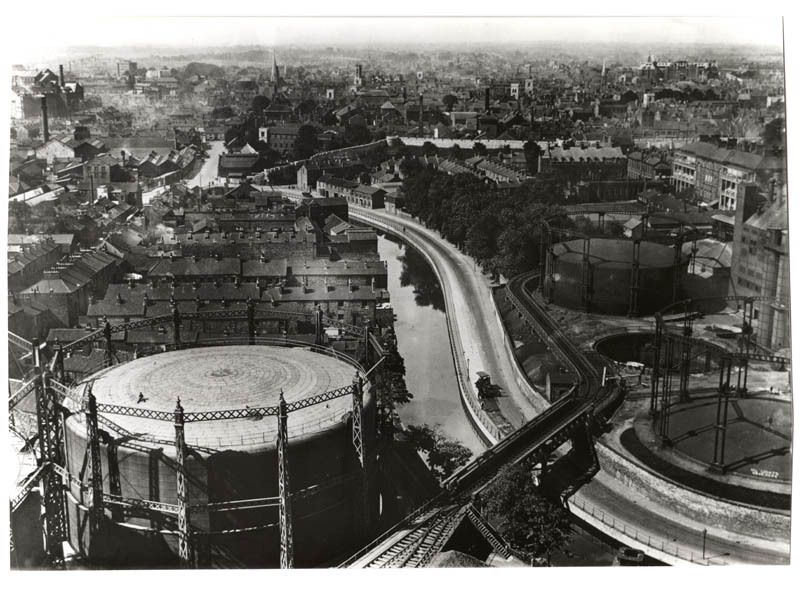 With, in the foreground, gasometers and part of the gas works (or gasworks as I tend to call it, running the words together, as I do with the carriageworks), and the demolished streets off Layerthorpe, including one called ‘Downhill Street’ according to the old maps. Somewhere at the back before the river bends round is ‘Chicory Yard’. Over to the far left, further away, is the Hungate area, chucking out smoke. Here’s the photo I included last March, asking if anyone could help me place where it was taken. I thought the buildings in the background were the gasworks, but which part of it, from which angle, wasn’t clear. 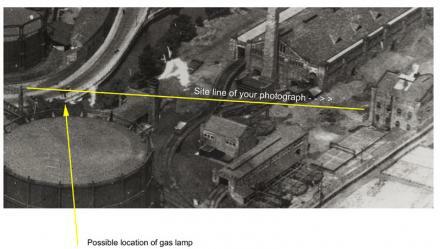 As can be seen from the above, it was a massive site, on both sides of the Foss, on Heworth Green as well as Foss Bank. 16 months on we have a proper location. We were almost right, but we needed to be over the wall, on what is now part of the Sainsbury’s site. I cared so much about that picture not only because it’s a great photo capturing a happy moment in a now lost landscape, but because the man on the right is my partner’s father. Sadly when this photo turned up in recent years I couldn’t ask him about it. He died in 2002. I remember him telling me about the gas works, about people he worked with, including Wally Knot, in his shed, smoking a pipe. 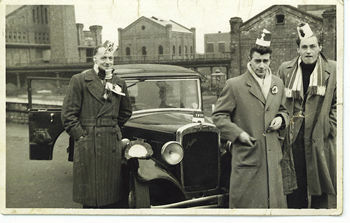 Thanks to Peter for the photos above, and to everyone who added comments on the page last year to help place the 1955 photo. If the embedded widget thing doesn’t work, try this link. I’ve got no information on the photographer or on who, if anyone, owns the copyright on these. An earlier page on the Heworth Green development: photos from Foss Bank (2008); some thoughts on the marketing of the development on the gas works site (2007); and a brief mention on a really old page (2004) from when they were digging and decontaminating the site. I wonder if Avril Webster- Appleton can shed any further light? She did the history of Layerthorpe, where some of my wife’s ancestors lived, and my wife’s aunt actually went to school with her in the area. I’ve dropped her a mail with the link! The aunt is due for a visit later today, I’ll ask her too! Layerthorpe. I am now in my eighties so need more time to recover. Will help if I can. 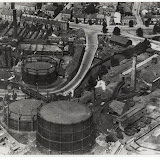 This is a very interesting little bit of information for me having lived in the Groves (Penley’s Grove Street which goes off to the top centre of photo 1) since the mid 50’s until the mid 70’s, and going to Park Grove school in all Infants, Juniours and in those days seniors too. I remember my father taking me to the railway bridge here to see the trains going over it to what I assumed was the hospital but could have been other parts of the Gasworks. I do not remember any gas holders on the hospital side (far side of the river) only two on the lower side. However I do not know if these two were rebuilt as one especially looked a bit different and in a different place. In my days there was a footpath from Heworth to Layerthorpe that passed these towers with a constant smell of gas etc and crossed the railway just before Layerthorpe. I can remember the little factory in the junction of Foss Islands (2 way road traffic until the 70’s and Heworth with the river behind.